I'm happy to announce a new website that I've made. CoinMarkets.today gives you a quick overview of what is going on in the cryptocurrency space. Quick overview of the price changes of the top 50 cryptocurrencies (24 hour, 7 day, 1 hour, Month-to-date). The charts update automatically every minute. Percentage of the total market capitalization per coin. Latest cryptocurrency news from various sources. Updates automatically every 10 minutes. Looks interesting, useful data. I am wondering how reliable it is, what api's exchanges are used for the charts, if you don't mind. Excellent! I really enjoy your news curation. I think the table could be made more readable by making it more like coinmarketcap.com, thus putting the ranking to the very left and include the name, not just the ticker. When you visit CoinMarkets.today on a mobile device you only see the ticker symbol due to the smaller screen. On a desktop computer you get the full name of the coin. That's a cool website, maybe an ordering of high to low would be a nice feature. Again, I really like what you are doing. It gives an excellent quick overview of the markets. 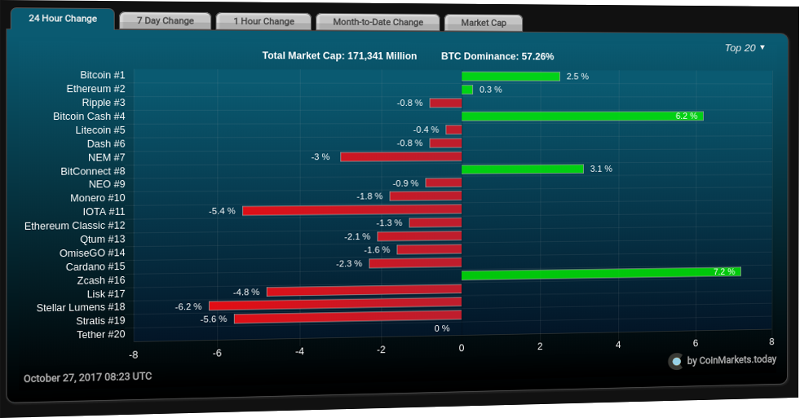 The visual affect really helps me understand the current market sentiment. I upvote all comments and replies on all of my posts to help my fellow Steemians earn Steemit rewards and gain more voting power. Consider doing the same to help other Steemians. Oh boy, that is an amazing page! Thanks for sharing it, you contribute quite a lot to the community with these analytical tools. I love this one. different from CMC, especially for news and chart. Congratulation. Just bookmark it. this is a good project, you make it well and the site is very needed by the people here. such as steemnow.com that is so incarnate and reliable. Awesome! Thank you! Much better than coinmarketcap! I greatly enjoy the setup you have here on the website. The gain bars are a nice touch and you include a lot of valuable information here. I would just advise to slowly add more coins as you go and fix bugs because ultimately people want to see as many coins as possible on the websites that they follow. Thank you for adding this to the sphere we need more people like you. Gods speed and Steem on! Pretty neat and tidy. I like this type of visual representations. It obviously has a similar design to steemnow.com. Btw, I wanted to share a little bug I've noticed on steemnow.com. If you look at my account there, in the post section, besides the regular posts that are up for a payout, there are two 3 month old posts. I suspect it's because the posts performed so poorly that they didn't even qualify for a payout which left them there. This is spam, you should refrain from being so blatantly self-promotional. Thank you very much for your information about coinmarkets.today. Have a nice day. Regards. That's awesome Pablo, great work. Thank you for giving us a chance to see all this info. That's everyhting it needs to be, congratulations! Valuable site! We need more tools like this to help keep the market educated on price movements. Thanks, following! good news , thanks for your sharing ! I have no plans at the moment to add an overview of new coins. There are so many new coins being issued and, to be honest, I think that 99% of those coins are just crap. The new coins appear on my website automatically once they enter the top 50 based on market capitalization. Yeah that's true, there are so many coins added every day and most of them are crap. Good work, I like it. I will look at it. Great job!will check it out . BTW, where do you get the data from? Straight from exchanges or do you use an API like coinmarketcap's? Leveraging the data you are putting together, smart. I like it. Congratulations, your post received one of the top 10 most powerful upvotes in the last 12 hours. You received an upvote from @thejohalfiles valued at 65.17 SBD, based on the pending payout at the time the data was extracted. Congratulations @penguinpablo, this post is the third most rewarded post (based on pending payouts) in the last 12 hours written by a Hero account holder (accounts that hold between 10 and 100 Mega Vests). The total number of posts by Hero account holders during this period was 252 and the total pending payments to posts in this category was $4157.77. To see the full list of highest paid posts across all accounts categories, click here. You can make it more user friendly by placing the crypto's names column also on the right side so it's easier to read. Congratulations @penguinpablo . It looks like you have developed a very useful and niche/positioning for your new site in what seems like a very crowded Internet so far as crypto-oriented websites are concerned. I will be jumping over to your site shortly and will continue to use it and be supportive. May I introduce you to my site which is also relatively new? ( https://marketstatsanalytics.com/index.html ) My niche is to do deep data mining and statistical analysis focused on studying relationships among variables and applying innovative indicators, and even including back testing from time to time. I will bring to the surface (for publication) what I hope will be innovative and useful articles presenting what I hope will be useful results of the data mining and analysis. These articles will be free at my site; but from time to time what I hope are useful collections of analytical tables/charts behind the articles will be on sale at my e-commerce website -- https://arawak-infosys.myshopify.com/collections/all . There is very little material at this website at this point; because I’ve taken down the bulk of stock market related products that used to be there, except for two still on display. When you get over to my site with free stuff ( marketstatsanalytics.com ) you will see no evidence of the kind of work which I outlined just now. The site used to be focused on the stock market stuff, and only recently have I redesigned it to have a focus on cryptocurrencies. I just popped over to your site and offer you a double congratulations. You’ve got into a really useful niche. For example, your site will become a feeder-site for my work in terms of bringing to my attention in a very timely way ‘hot’ issues on which I might do some useful data mining and analysis. this is such a cool tool man thank you for helping the community! keep it up! Wow, excellent creation. This is definitely of great value. Thank you for your hard work! what source of info you use for arbitrage? I will love to do a promotion for the website by writing a review about it on both my steemit blog and self hosted blog. I need your permission to do this boss. That would be great! Thank you in advance! Thanks, but the comma is a thousand separator. The current total market cap is $181.117.150.202. Though would be less confusing for someone like me if it's just written like 181 billion or $181.117.150.202. Exactly what I needed! Super lean, simple and informative. Thank you @penguinpablo!! Added to my crypto tools ! Ok, this is really REALLY nice! The @OriginalWorks bot has determined this post by @penguinpablo to be original material and upvoted(2%) it!